The claim to fame of Pierre Jaquet Droz (1721-1790) was his lifelike automata, also called androids. If you have seen the movie Hugo, you will immediately understand what I mean. Directed by Martin Scorsese, the Oscar-winning film set in 1930s Paris revolves around a mysterious automaton. In Neuchâtel’s Museum of Art and History there is a particularly famous trio of realistic-looking androids bearing the names the Writer, the Draughtsman, and the Musician. 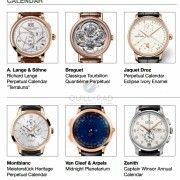 These were begun in 1774 by Pierre Jaquet Droz and completed by his son. If you’re ever in the area, it’s worthwhile to stop in and see them; the truly lifelike objects are activated every first Sunday of the month at 2:00, 3:00 and 4:00 pm so that visitors may see them in action. Or you can have a look at this Watches TV video, which highlights Jaquet Droz’s history in androids: www.thewatches.tv/en/editorial/automates-merveilles-the-legacy-of-the-jaquet-droz/. Continuing this long tradition, at Baselworld 2014 Jaquet Droz released an ultra-modern rendition of an automaton. Like all horological progressions throughout the decades, this new automaton utilizes traditional techniques that have been miniaturized and modernized. In the three androids now located in Neuchâtel, mechanical cam technology controls the movements. In the new Signing Machine, the cams have been miniaturized to fit inside the smartphone-sized machine. Additionally, the cams are hand-made so as to produce the most fluid writing script. Indeed, like the Writer, the Signing Machine scripts out what it has been programmed to write: the bespoke object, manufactured to the behest of each owner, can write whatever its proprietor defines. The Signing Machine is fully mechanical; there are no electronic parts. This means that it must be wound before it can take action. A lever on the side of the case is the magic trigger point, while finger pressure elsewhere releases a hinged arm and a pen when the owner is ready to sign something. A four-digit security code ensures that only the owner can make the automaton do his or her bidding. The Signing Machine looks a little unspectacular in terms of visuals when compared to the Writer and contemporary Jaquet Droz creations like the Bird Repeater. So I asked CEO Marc Hayek about the smartphone-like, minimalist style of the black-and-grey object. Very recently, Jaquet Droz added the tagline “Art of Astonishment” to its communication. Normally, I wouldn’t pay much attention to something like a brand’s tagline, but I have been paying much more attention to Jaquet Droz (yes, even its marketing) since seeing the wondrous Bird Repeater, which is yet another ode to the miraculous androids of the eighteenth century. It was introduced during 2013 in honor of the 275th anniversary of the androids. The “iJaquet Droz,” – which one might jokingly want to call the Signing Machine – is astonishing in its own way while continuing the brand’s golden thread: a Writer with a contemporary spirit and look. “It’s different than anything Jaquet Droz ever did and anything that you have seen on the market…there’s humor, sarcasm, technology in it, a little bit of provocation, watches, iPhones, iPads, i-anything. And it’s purely mechanical,” Hayek revealed. Pierre Jaquet Droz’s inventions were simultaneously aesthetic and emotional; their pleasing appearances coupled with eerily human-like motions hardly allow one to fathom the mechanical technology hidden underneath the facades. The modern incarnation of the brand has done an amazing job recreating the feel of these objects, with the Signing Machine representing the next – modern – step in its evolution.